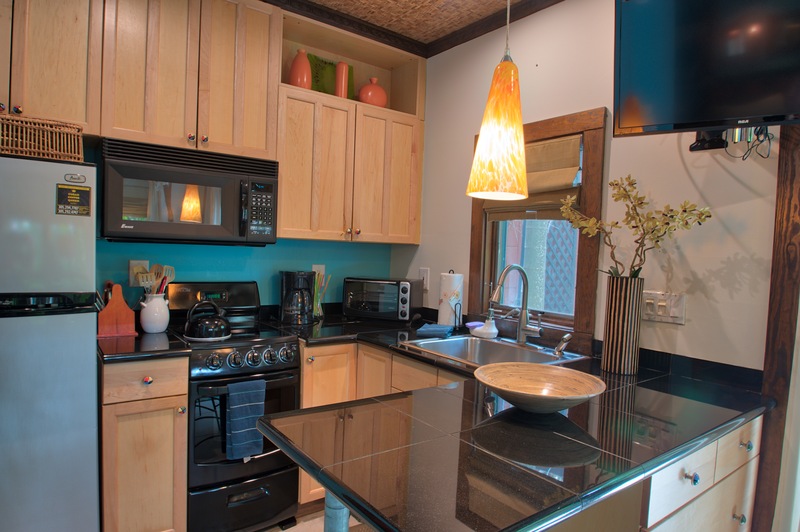 Perfect for two, this Bali-style studio cottage has it all: comfort, privacy and location. The Old Town Bali Hideaway studio has a queen-size bed and sitting area, efficient European-style kitchen, bath with walk-in shower, tiled floors and bamboo ceilings. 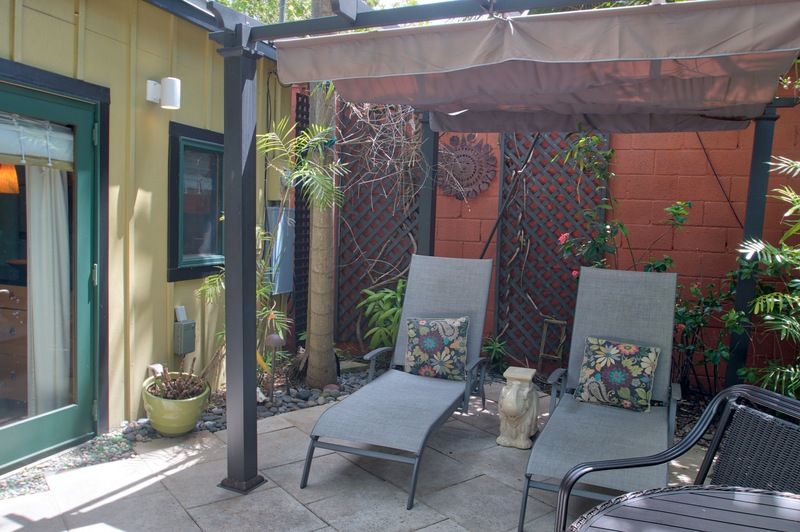 Relax in the private fenced-in patio courtyard or around the large, shared free-form pool and tropical garden. Here at Bali Hideaway you will feel as though you are in a peaceful retreat, yet still a part of all the Key West action. A perfect alternative to the high priced hotels in the adjoining area. The positives outweigh the negatives, and we would definitely stay here again. The bungalow was the perfect size for the two of us, and the place was exactly like the pictures. There isn’t a lot of drawer space, so depending on how long you stay, you can use the shelving next to the bed in addition to the 2 drawers that are provided. The bathroom is a nice size, shower space was large, and the water pressure was amazing! I would recommend you wait to buy anything until after you check in. There was sunscreen, soap, booze all at the house left over from the previous renter. Location! You can’t get any closer to Duval AND have a quiet space. One block behind Sloppy Joe’s, it’s a quiet street, low foot & car traffic, and a food cart vendor right around the block if you wanted a quick bite after the restaurants closed! There is no parking, so if you are driving you will need to find either a lot or free parking somewhere. A lovely cottage in the midst of a beautiful tropical garden; quiet and yet close to everything! Enough space for two and travel gear, and we carry a lot of gear with us! Enjoy Bali and it's quaint style. The pool is great, and we love our patio with this property!! the minute I arrive I feel like I'm at home and I completely relax. Always clean and spotless and never a disappointment...ever. We enjoyed Bali Hideaway. It felt like you were in Polynesia, but only steps away from all the fun that Key West has to offer. We enjoyed the pool area almost every day. Would definitely return. Eine Insel mitten in der Altstadt, sehr zentral und doch ruhig gelegen. Das Appartement war sehr sauber und gemütlich. Wir haben uns ausgesprochen wohl gefühlt. Den Pool hatten wir meistens für uns allein. Aber auch unsere einzigen Nachbarn waren äußerst nett. Insgesamt haben wir uns rund um wohl gefühlt! I have stayed here for quite a few years. It's like going home each time! It's always spotless clean, comfortable and in a great location! Love the folks at Rent Key West vacations! I highly recommend you stay here just don't take my week LOL! Thank you for your 5 star review! We truly appreciate your business and enjoy seeing you come back every year to Bali Hideaway. We look forward to seeing you in 2018! Excellent location and very clean rental. Bali Hideaway had everything we could ask for and although it was in a great location, close to everything, we did not hear any of the hustle and bustle on the streets. My husband and I thoroughly enjoyed Bali Hideaway and look forward to returning in the future. Bali Hideaway is a Great Hideaway! The property is in a great location and you don't hear all the noise from Duval street. The room had everything you could need to stay there for a short time or an extended amount. My only complaint is for the amount of money we're spending we're also expected to pay to wash your towels? We were there 10 nights and supplied with 4 towels for the both of us. I guess I figured we might have been contacted at some point during our stay to see if we needed anything. It's nice to have the laundry facilities close by but I don't think I should have to spend my time hanging out to pay to wash your towels. Thank you for your review of Bali Hideaway. Our main priority is to be able to offer a clean, comfortable, well maintained property, and have our guests enjoy their stay with us. We hope to see you again! This adorable cottage is less than a block to Duval Street, a block from the Historic Seaport and two blocks from Mallory Square. Yet, it is very private, very quiet and very tropical. Perfect cottage for two. 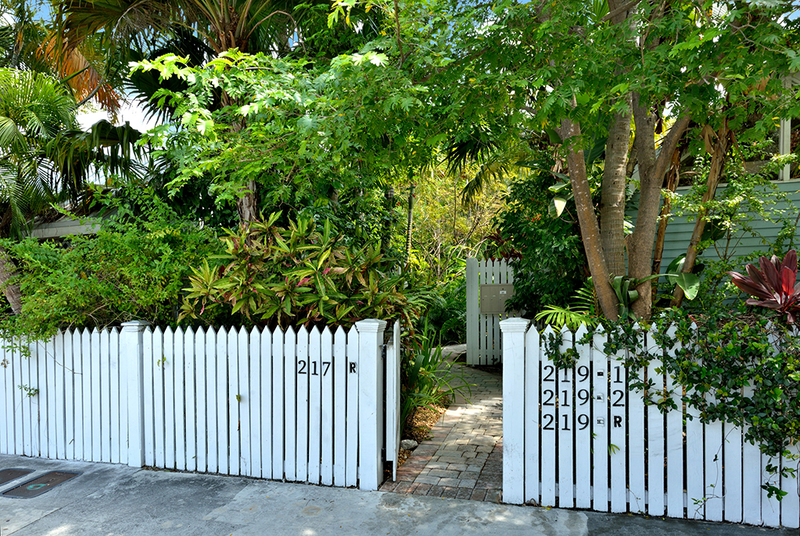 Very private, yet so close to all the amenities in Key West. No vehicle needed, just bike or scooter around the island. Perfect kitchen to prepare small meals. We will definitely visit again! This was the second time that my husband and I stayed at Bali Hideaway. We arrived after hours and retrieved our key from the lockbox. I must say, it was not well lighted and I found it very difficult to see the numbers on the combination lock...we had to ask the restaurant next door for a candle. We easily found the property and were lucky enough to get a parking spot on the street. Parking in the lot is now $25 per 24 hours...ouch! Bali Hideaway had been painted and redecorated and was simply beautiful, as well as being very clean. It had everything you could ever want or need in the cupboards....even mosquito spray. The location is on the next street over, behind Sloppy Joes, but at night you would never know, as it is sooooo quiet. We have never felt unsafe in Key West; whether it is walking along Duval St or just off of it. My three favourite restaurants are Sarabeths, Salute and Kellys. Key West is a magical place and Bali Hideaway is a perfect place to stay and enjoy it. I would absolutely recommend it for a romantic getaway. Our experience was very good. Loved the location and wonderful Cocoanut trees. Only one complaint: The coffee grounds had been in basket with mold. Not a big deal. Great place for a 35 Wedding Anniversary! This is a compound of 5 vacation rentals. While we were there only one other cottage was rented, very private. We had the pool all to ourselves. Place was clean and comfortable. We had a private courtyard with lots of foliage, very pretty. Only negative, pool needed to be vaccumed, stainer full of leaves, but water was clear. My Girlfriend and I had a awsome stay in Bali Hideaway and working with RENT KW was a great experiance once again. The Hideaway is in a quiet cozy compound near Sloppy Joes Bar but you would never know it because its sooo quiet and peaceful. We will most surely rent the Bali Hideaway again as we truely loved it and the compound its located in. If you rent in this compound be sure to pet and say hello to Minny the compound kitty cat. I love Key West!!! My husband and I stayed here for a week while celebrating our wedding anniversary. From the second we stepped into the property, we were absolutely blown away by the quality! This place is gorgeous! It is the perfect location. We walked everywhere. Literally just behind Sloppy Joe's, but on a small one way street. From the street, you cannot see any of the houses, just a cute little white fence. There is a gated, locked entrance so it is very secure and safe. 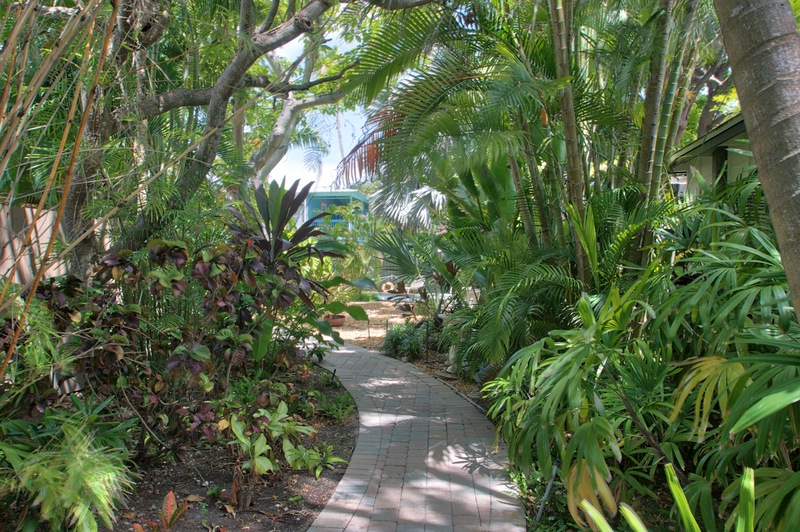 When you step into the property, you are surrounded by lush tropical plants that make each rental very private. The Bali Hideaway is especially nice because it has it's own locked gated in the back of the property, with its own beautiful patio. The entire property is so quiet, we felt like we were the only ones staying here! The pool is gorgeous- we never saw anyone else there! You can tell the owners really keep up with these rentals- there was always landscapers taking care of the beautiful gardens. I was also so impressed with how stocked this rental was- it had everything! So incredibly impressed with this rental (and the rental company). We are already planning our second trip back to Key West and will absolutely stay here again. It's perfect! The studio itself was perfect. It was clean and had everything we needed, including bug spray. Which we did need every time we walked outside. This was my only problem with the condo- the Mosquitos were terrible. The pool was perfect and the cat that lives on the property was the sweetest. The rental agency was great to work with. The location was not the perfect place for my fiancé and I. I knew it was near Duval, and I thought we'd have a good time- but it's just not for us. I don't think I'd stay at this property again only because of the location, but I would definitely rent with this company again. They were fantastic through every part of booking!! Great location. We enjoyed our stay very much. We absolutely loved the rental! It was tucked away amongst all lush tropical greens of Key West and you wouldn't even know it was in there. It was nicely decorated and had everything we needed. We had absolutely no complaints at all and this was one of our best trips we've ever had. Even though it was within walking distance of all the restaurants and bars, it was extremely quiet, its own private sanctuary. The only opportunity for improvement that I can offer you is more frequent groundskeeping, especially when things are in bloom and falling into the pool and garden area. Otherwise I've been there before and I'll be back again! This years experience in KW was the best ever, weather was perfect, working with Rent Key West was perfect, the food and spirits was awesome, just an overall great week. Secluded,quiet,comfy and yet, in the middle of where KW happens. Thank you for your 5 Star review! We truly appreciate your business. We are very happy to hear that our staff and Bali Hideaway met your needs and expectations. We hope you will stay with us again. All went great. Bed was a little to soft, but all else was perfect. It was restful and relaxing in this hidden oasis right in the heart of KW. Great location to get anywhere at the same time a peaceful secret garden to escape to at the end of the day. Only disappointment was the pool, which is not heated. Thank you for taking time to review our property, Bali Hideaway. Your feedback is important to us. We are happy to hear that you enjoyed the property location and beautiful quiet garden area. As for the pool not being heated, that is something we try to make all our guests aware of. On our website the property description states unheated shared pool. We greatly appreciate your feedback and hope you will stay with us again. The Bali Hideaway is an amazing place to stay in Key West! The decor really puts off a laid-back vibe concurrent with the rest of the town. The one room was perfect for just my boyfriend & me as we really just needed a place to lay our heads. It was a great place to regroup after hot & humid adventuring around the city. The place is in a perfect location- a block away from Duval & a quick walk to Mallory Square, but far enough away from the loud hustle & bustle of the constant night life. We didn't cook "at home" (way too many awesome restaurants around! ), but from glancing around, there seemed to be enough cookware available to do so. Besides the fluctuating water temp in the shower, everything in the Bail Hideaway was perfection (sometimes a chilly shower was welcome, anyway!). We are ready to move in!!! We had a great stay in Key West. (Not our first visit.) Everyone at Rent Key West was very informative and helpful. Bali Hideaway was very conveniently located to all the action at the North end of Duval. The decor and cleanliness was great. We thought we wouldn't be bothered by the shadey grounds and the cold pool, but we missed having a sunny place to park our Duval-weary feet and a not so cold pool to relieve the afternoon heat. So the grounds went unused by us. There were a few bugs making an appearance in the bathroom but nothing that we were really worried about. We will be returning to KW but the determining factor in us not renting Bali Hideaway again is the musty smell in the whole place, we did notice that there was some mould making an appearance in the bathroom closet. We will use Rent Key West again! Thanks for all your help! I once lived in K.W. 42 yrs.ago. The privacy that the Bali Hideaway provided was purely romantic and truly felt like old wife and I fell in love again during our stay and where we stayed added so much to the experience. And,you found everything only 3 blocks in any direction.I would like to add a special thank you to Ms. Doreen,a very elegant lady. And the only real conch cooking is at 308 Petronia,The Conch Shop. This is a lovely little gem located just around the corner from Duval Street. It is a private, romantic bungalow with a beautiful pool available to guests. The location is perfect with everything within walking distance. We would definitely rent Bali Hideaway again! This was our second stay in the Anne Street compound and our first in Bali Hideaway. Great place to stay for a couple or a single. We really enjoyed the private patio for morning yoga or afternoon reads/cocktails. My only minor complaint is that you the position of the TV will give you a crick in your neck if you are a TV watcher - but why go to KW to watch TV! Being avid tea drinkers and in the absence of a tea pot we bought and left a Bodum press. Enjoy. This is a very nice and convenient place to stay. It would have been more helpful if the manager had a book on file to cover the items that occur during a usual stay-how to operate the TV, stereo, local places to eat, rent bikes, tour groups etc. Everything was wonderful! Great location, beautiful accomodation. The ONLY thing was we wish we had a little bit more space to spread out. Other than that, we'd stay here again in a heart beat! I had been to Key West several times but this was the first time for my friend...and she loved the Bali Hideway. It is a great location, loved the privacy and the room was perfect. Will definitely stay there again on our next visit. We love Minnie (the cat) too! We loved our stay here. The unit is perfect size for two and it is well stocked with just about anything you could need. The bed is comfy and the air conditioner works very well. The kitchen has everything you could need. There are even pool towels and suntan lotions to use. The pool was very nice and peaceful, we only saw one other people the whole week. The pool water was warm too. The only frustration we had was with the shower temperature, it never stayed steady and would go from warm to scalding to freezing when no other water was being used in the unit. We eventually learned to manually adjust the temperature several times during the course of a shower. But this is not enough to keep us away, we'd go back again. The location of the unit is so close to everything but none of the noise. It will be very quite in your hideaway. You can walk everywhere. You don't really need a car unless you go to other keys while staying. Parking is not available at the site but there is a parking lot just around the corner and we got a week of prepaid parking for $90. During our stay we took the ferry out to the Dry Tortugas and camped for two nights. It was amazing. I recommend it to anyone interested in snorkeling or history. we came to keywest to get married on the beach so this little cottage was perfect for the two of us to have privacy,and everything was so close,we walked everywhere.we definatley will use you again for our next vacation!!! 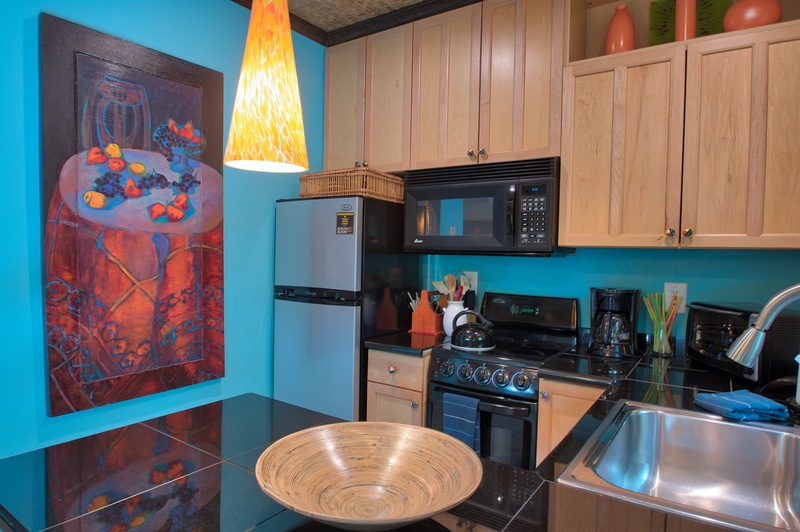 This was a great little studio rental with a private patio which was poorly cleaned and maintained. The website pictures were obviously taken quite a while ago when first renovated and cleaned. The bathroom smelled (toilet problem) and top of bathroom closet had a mold problem. All of the locks (gates, house, property entrance) were either broken or difficult. The landscaping was in need of attention. The cover on the patio settee was covered in mold. It was poorly cleaned - my husband and I both notice that our feet were dirty without minutes. It was a shame to see such a nice little place so neglected. Spent our honeymoon here. Perfect location!! Right around the corner from Duval St, the harbor, and Mallory Square. But never heard any noise from the street. Quiet, secluded, and tucked away, but in the heart of everything as well. The property and experience exceeded our expectations. We hope to come back and we would recommend the property to anyone. Bali Hideaway is a charming, cozy cottage. Perfect location as it is right off Duval but very quiet and comfortable. Thorougly enjoyed my stay. I would have given my review 5 stars if the bug person would have sprayed the first day and I wouldn't have had to deal with the bugs. Otherwise it was perfect!! Came in to key west for a wedding. This was a perfect location and although it did not have parking we found a spot on the street very close by. Loved both the inside and the outside. Customer service upon arrival was not great. Property manager was awesome as well as reception at check out. The area was well secluded and even though we were a stones throw from Duval street~it was quiet and well kept. Security was somewhat lacking-one of gates doesn't lock, but we had a secondary private gate to our area, so that didnt matter to a great extent. Room was nice-missing a drawer knob here and there...furniture was in ok condition. Great stay overall! I'd rent there again for sure. The best location in Key West, FL. only down fall is that there isn't any parking, so you have to find a lot to use and pay. Other units have parking but this one does not. We stayed at the Bali Hideaway for our honeymoon. It was in an ideal location and the accommodation was perfect for the two of us. The pool area was lovely and we had it to ourselves most of the time. We would definately recommend this place. The location was perfect! A block from the waterfront in one direction and a block from Duvall St. in the other. The property is beautiful, very private and tropical. Some people have complained about the door... it's tricky at first to figure out how to lock it, but you get the hang of it after the first day or so... there is also a lock on the gate to the back yard, for added security. The suite is small, but you can see that from the pictures... the outdoor patio area is also very private and pretty. Our ONLY complaint, is that there were roaches. The suite itself looked clean, the bathroom, kitchen and cabinets all new and clean. But there were roaches... they seemed to come out more when the closet door in the bathroom was open for some reason... so we kept it closed. I hate to leave a negative review at all, because we had such a great time and it would have been perfect if not for that one thing. As far as the customer service, we ended up missing our flight down, and finally arrived around 11:30pm. I had called from the airport and they gave me instructions how to get to the office and pick up the key from a lockbox they have outside. They were very nice and helpful. They also called on the second day to check in and make sure everything was okay. I informed them about the "pest" issue, and so maybe they've taken care of it by now. We stayed 5/16-5/23. Our rental experience was wonderful and they went out of their way to be helpful.We will use them next year as well.Everything was clean and orderly.Great location ! This property was perfect for my fiance and I.
I would definitely stay at this property again. It was so convenient and had everything we wanted and needed. 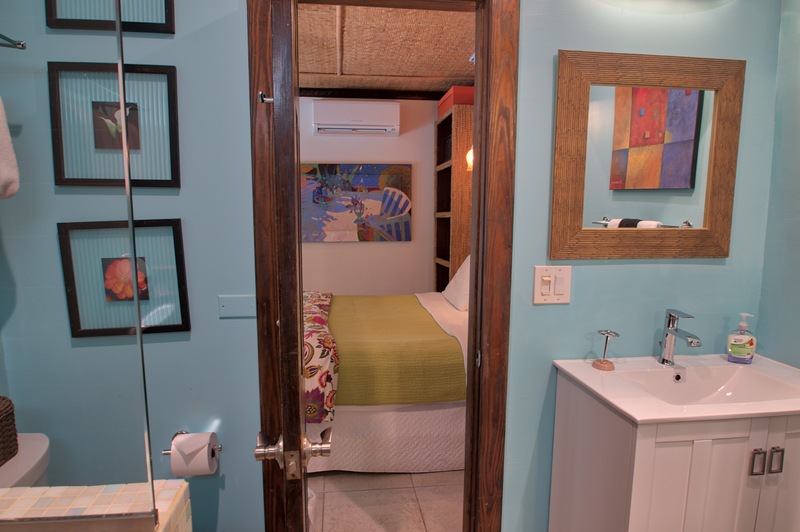 Everything we could wish for a comfortable, very private and relaxing week in Key West! Small but well-equipped. Loved the private courtyard and the shared pool area. It felt remote, but was so close to everything. I would definitely rent this place again. This property is awesome..best location ever. Only a block from Duval and yet very quiet. 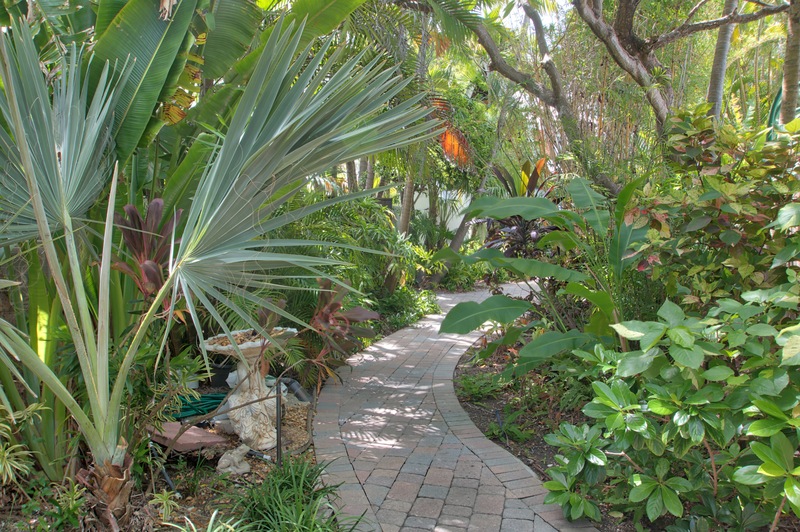 Very tropical shaded setting with many beautiful plants, fenced property and just perfect! Exceptionally peaceful and beautiful decor. No problems with locking the door (as mentioned in other reviews). The owner explained once and no problems with the door after that! Our friends loved the place also and on their next visit will be staying there. Kitchen has everything you need if you choose to stay in. The bed was comfortable and had nice linens. The A/C was great and quiet. Perfect size for two with ample storage and a great patio area. Can't wait to come back and stay again! We had a wonderful vacation! We arrived after hours and picked up keys, left before hours and dropped off the keys so we never had any personal contact with the rental company. We loved the place - quite tiny but fine for two! The location was perfect for walking everywhere, although we rented a car and went to the beach daily. We worked a deal with the parking lot behind the unit for a better weekly rate. (on Simonton) Too many restaurants to comment on, although Blue Heaven was one of our favorites! We also had good breakfasts at Two Friends. The condo was super private, the pool is pretty, but there is so much foliage you can't sit in the sun, which was the only negative for me. If I return to Key West I will stay here again. Perfect Location for Duval Access, and still QUIET and Classy! Fantastic experience. Great folks to rent from. They are real pros and its obvious in everything they do. Great location. Clean and cozy cottage. Really liked working with the rental agency. Quiet & private while being in the middle of the action. This is a well hidden retreat just off of Duval. While the location is premium, the accomodations are not compromised. It is clean and beautiful. The only fault is the inadequate lighting in the living space. Lovely private surroundings just 1 minute from Duval attractions. The place is very nice and location is great. Only complaint is thT there are cats that basically live outside your door the entire time and since we are both allergic to cats that was not very good. The Bali Hideaway was the perfect place for our Anniversary celebration. 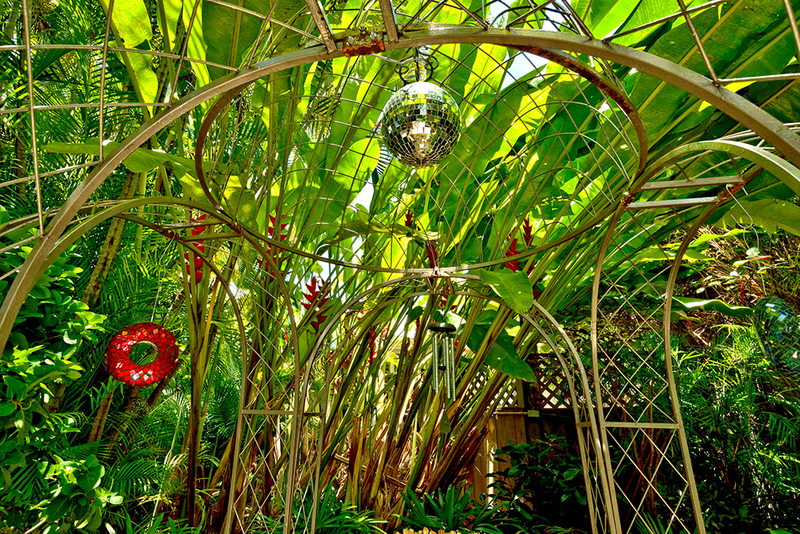 The private tropical garden atmosphere complimented the well decorated cottage. The well equipped small kitchen was fun to use for breakfast and happy hour. The revelry and crowds of popular Duval St. were conveniently close, yet the Hideaway, on a nearby quiet street, was peaceful. We will return! !